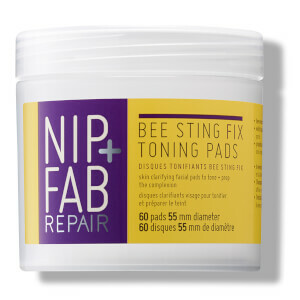 Refresh and revitalise your complexion with NIP+FAB Bee Sting Fix Toning Pads. 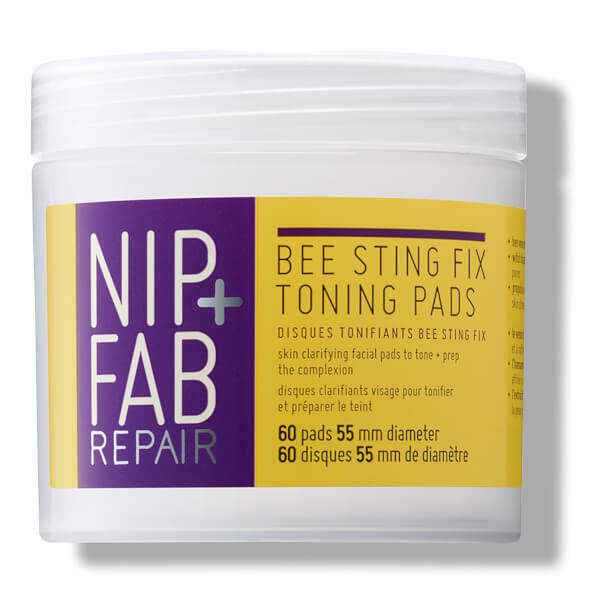 Harnessing the plumping and firming benefits of Bee Venom, the pre-soaked pads clarify and cleanse skin; simply swipe over the face and neck to eliminate daily dirt and impurities without over-drying. Synergising Witch Hazel, Allantoin and Propolis Extract, the face pads deliver intense moisture and hydration, whilst minimising the appearance of fine lines and wrinkles for a smoother, more refined complexion. Skin is purified, rejuvenated and prepared for your skincare regime. Wipe one pad across the face and neck to leave skin feeling refreshed and toned. Patch test prior to use. Aqua (Water/Eau), PEG-6 Caprylic/Capric Glycerides, Glycerin, Hamamelis Virginiana (Witch Hazel) Water, Gluconolactone, Parfum (Fragrance), Alcohol, Sodium Benzoate, Cetrimonium Bromide, Disodium EDTA, Propylene Glycol, Allantoin, Calcium Gluconate, Propolis Extract, Limonene, Citronellol, Phenoxyethanol, Bee Venom, Ethylhexylglycerin.